Voltage regulator integrated circuits are widely used in electronics. There are two main types of regulator: linear and switching. This page concerns the linear variety. The idea of a regulator is simple: you place it between an irregular voltage source (such as a battery, a solar cell, or an 'unsmoothed DC' supply) and a circuit which requires a constant supply voltage. Even if your circuit can work from an unsmoothed supply it may still be a good idea to use a regulator because built into it is a current limiting feature which will protect the supply when you accidently short it on your circuit. 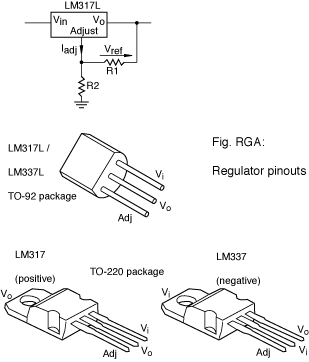 The simplest regulator of all is called a three terminal regulator . There is one connection for the unsmoothed input, one for the regulated output, and one for a common. They are obtainable for outputs of 5, 12, 15 or 24 volts, either positive or negative. You also have a choice of permissable current capability: most often 100mA or 1A. Last modified: 2007 February 23rd.